A new report on the nutrition policies of Australia's major supermarket chains has found they could be doing much more to promote healthy eating. A first-of-its-kind study conducted by the Global Obesity Centre at Deakin University has assessed the nutrition policies of Australia's major supermarkets, finding they could be doing much more to encourage healthy eating. "Unhealthy diets and obesity are leading contributors to poor health in Australia. Tackling the issue requires a comprehensive societal response, including government policy and wide-scale action from the food industry, which includes our supermarkets," lead author Associate Professor Gary Sacks said. Researchers rated the policies of Woolworths, Coles, Aldi and IGA out of 100 in the review which examined six key areas including nutrition labelling, promotion practices and product accessibility. The data included publicly available information collected until the end of 2017 plus policy information provided by the retailers. The information was then assessed using the 'Business Impact Assessment - Obesity and Population Nutrition tool' developed by INFORMAS, a global network of public health researchers that monitor food environments worldwide. "Their food labelling was where they scored pretty well, most of the supermarkets have committed to rolling-out the government's Health Star Rating system that makes it easy to see which products are healthy," Prof Sacks said. Woolworths also scored "okay" when it came to promoting healthy food, but they "fell down" due to the heavy promotion of unhealthy food, Prof Sacks said. "The supermarkets are quite vocal about being healthy places to shop but the reality is once you are in the store there is heaps of promotion of unhealthy food," he said. "The end-of-aisle displays are typically filled with unhealthy products, it's just chocolate and soft drinks at the checkouts; so it's just really hard to stick to a nice healthy basket of food when you are surrounded by all of that." 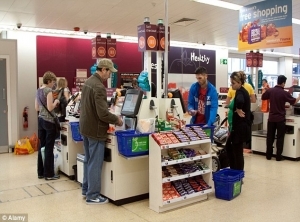 In the UK several supermarkets have committed to providing healthy checkouts with no chocolates, soft drinks or lollies on display and the researchers are calling for Australia to follow suit. "The key is that those supermarkets have done it which means it's feasible, they haven't gone out of business and that is evidence that supermarkets can make that move and they are still viable as a business," said Prof Sacks. The researchers have also called for the supermarkets to have fewer price discounts on chocolates and chips and instead make healthy, fresh produce more affordable.